WESTBURY, NY--(Marketwired - December 15, 2015) - Tracer Products manufactures a complete line of products to uncover all refrigerant, air brake, tire, coolant, hydraulic fluid, vacuum, wind, water, and other leaks fast and effectively for heavy duty/fleet vehicles. 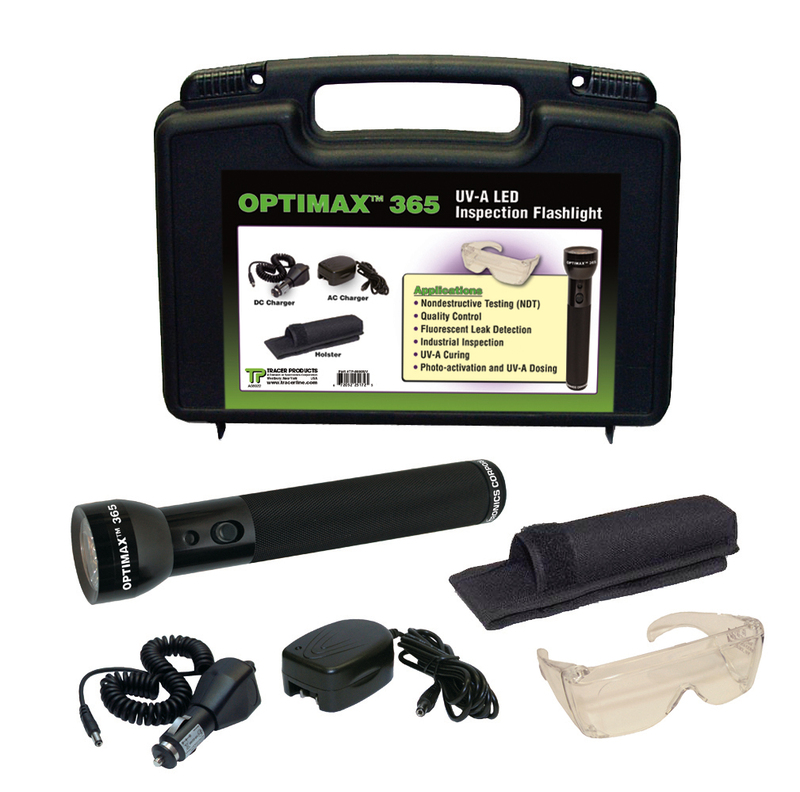 One such product is the powerful Tracerline®OPTIMAX™ 365 (P/N TP-8690UV) -- a cordless, rechargeable pure UV (365 nm) leak detection flashlight featuring state-of-the-art, ultra-high-flux LED technology. This high-intensity UV leak detection lamp works with all automotive/truck systems and fluorescent dyes, including difficult-to-fluoresce yellow dyes! It easily pinpoints oil leaks in diesel engines, even when the oil is extremely dirty. The OPTIMAX 365 is extremely lightweight and compact, weighing just 11.8 ounces (335 g). It has an inspection range of 25 feet (7.6 m) or more. The flashlight has a corrosion-resistant, anodized aluminum lamp body, which will stand up to years of heavy shop use. Powered by a rechargeable NiMH battery, it provides 90 minutes of continuous inspection time between charges. The LED lifetime is 100,000 hours. Just the push of a button turns the lamp on instantly at full power. Along with the OPTIMAX 365, the kit also includes UV-absorbing spectacles, a belt holster and smart AC and DC battery chargers. All components are conveniently packed in a padded carrying case. The AC charger is available in 120V, 230V, 240V or 100V versions.